5.0 cu. ft. oven capacity and 2 oven racks Provide enough room to cook an entire meal at once. 4 burners Offer between 5,000 and 12,500 BTUs of heat for flexible cooking options. The 12,500 BTU burner brings water to a rapid boil to help reduce cooking times. 5,000 BTU Precise Simmer burner Provides low, even heat to help keep delicate foods from burning. In-oven broil function Allows you to make healthy meals with ease. Delay-bake Lets you program the oven to start cooking when it's most convenient for you, even if you're not at home. Certified Sabbath mode Safely maintains a temperature for an extended period of time in order to comply with kosher cooking practices. Storage drawer Offers a convenient place to store cookie sheets and cooling racks. Sealed cooktop burners Contain spills for quick, simple cleaning. Electronic touch controls With locking capability ensure easy operation. Incandescent interior oven light and window Let you monitor the cooking progress of food without opening the oven door and releasing heat. 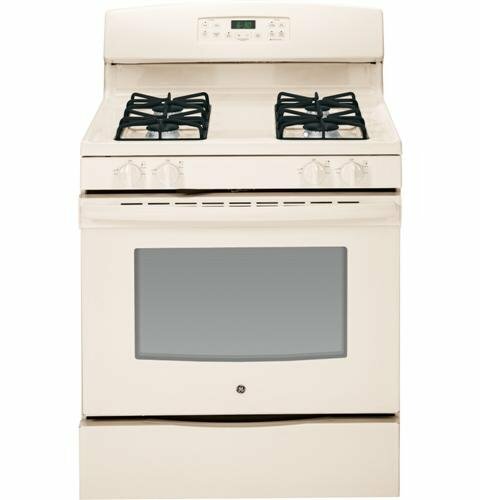 12,500 btu burner precise simmer burner self-clean Oven 5Cu. Ft. Oven capacity sealed Cooktop Burners in-oven broil^^color: bisque certified sabbath mode commercial category: free-standing ranges RANGES, OVENS & COOKTOPS number: jgb630defcc TOTAL capacity (cubic feet) : 5 Oven cleaning type: self-clean Cooktop burner type: sealed Oven control features: auto self clean control lock capability delay BAKE option audible preheat signal overall height: 46.25 overall WIDTH: 30 overall depth: 28.75.